WhatsApp has become a powerful and popular messaging platform. The company announced that they’ve successfully crossed over the 300 million active user milestone and declared 11 billion messages and 325 million photos are sent per day. 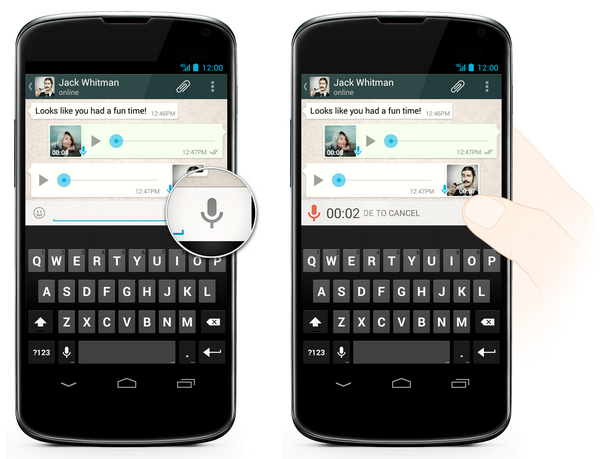 To continue its dominance in the space, WhatsApp has rolled out push-to-talk voice messaging to its users. Now iPhone, BlackBerry, Android, Windows Phone, and Nokia Symbian users can easily share voice messages via the associated apps. To use the Voice Messaging feature within WhatsApp you tap and hold the Voice Message button (looks like a microphone for touchscreen devices and it’s the center button on keyboard devices). Once you send the message the microphone will turn green for the voice messages not listened to, or blue for messages that have been heard. Certainly a great addition to the app.